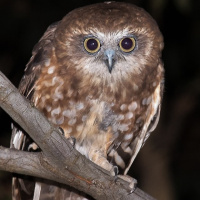 The Southern Boobook is a medium-sized brown owl with a rounded head and no ear-tufts. Its unmistakable boo-book song is well known in Australia. 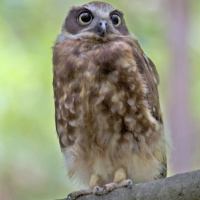 It is also known as the Spotted Hawk Owl. Typical call - Engadine, NSW, Australia. October 2003. © Richard Jackson. Description: There is considerable individual and geographic colour variation. 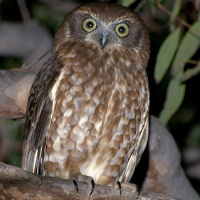 The facial disc is paler then the feathering of the head, and has large dark patches behind each eye, and an indistinct whitish rim. The eyes are pale greenish-yellow to yellow and the bill is bluish-grey. 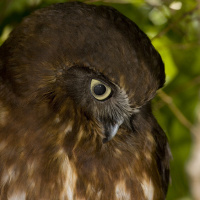 Upperparts are pale to dark brown with irregular pale or white spots on the wing-coverts. The scapulars have relatively large whitish areas on the outer webs, forming and indistinct whitish row across the shoulder. The primaries and secondaries are rufous-brown with dark brown bars. The tail is dark rufous-brown with paler bars, becoming whitish-buff on the inner webs. The throat is whitish, and the rest of the underparts have broad rufous-brown streaks and cross-bars. Tarsi are feathered, and the brownish-grey toes are bare, with bristles on the upper-side. Claws are dark horn with darker tips. Size: Length 27-36cm. Wing length 188-261mm. Tail length 100-160mm. Weight 146-360g. Females often larger than males. 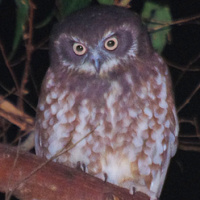 Habits: Generally nocturnal, roosts by day in thick foliage. 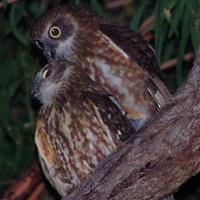 When threatened, they sit bolt upright, with feathers pressed tight against the body, and turn side-on to the source of the threat, appearing long and slender. Voice: Normal call is a brief double hoot with the second note pitched lower than the first, each note lasting for about a quarter of a second with a half second gap in between. There is usually a brief pause and then the call is repeated at a frequency of about twenty calls a minute. Calling may last for only a minute or two or may go on for hours. Boobooks also call in a low, soft 'pot pot pot por pot pot por'. This is a call between mated birds but its use is not confined to the breeding season. 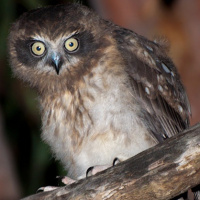 The breeding call is a tremulous braying call, the equivalent of the bleating call of the Powerful Owl. 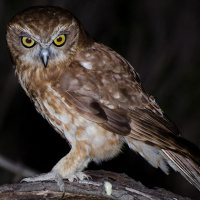 Hunting & Food: The type of prey taken seems to vary greatly with individual birds. Generally feeds on small mammals, especially the House Mouse Mus musculus, and birds up to the size of a House Sparrow. Will also take invertebrates including beetles and moths. 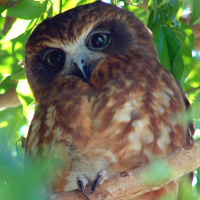 Hunts from a from a perch, such as a low branch or fence-post. Flying insects are taken by hawking flight through and above trees, taking only one insect each flight, and transferring it to the beak before bringing it to the nest or landing to eat it. Other insects are snatched from foliage or caught on the ground. Breeding: The breeding season is August and September almost throughout Australia. Pairs perch close together with the male giving 'pot pot por' call for long periods. This may commence well before start of season. 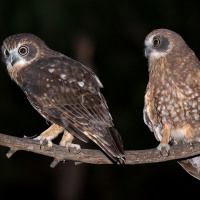 One or both birds may roost in nest hole together for weeks before breeding starts but these out-of-season roosts are not always chosen as the eventual nest site. The nest can be a wide variety of tree hollows - the tree may be alive or dead with a hole in a limb or the main trunk, upright or sloping. The male cleans out the hollow before eggs are laid - usually 2 or 3, rarely up to 5. The eggs are white and almost round, being 40-45mm by 32-37mm. They are laid at 1 to 2 day intervals and are incubated for 35 days. 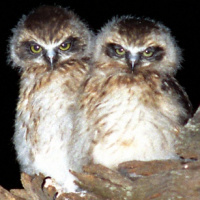 The young have white down and are fledged in 5 to 6 weeks. 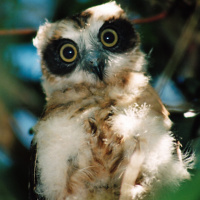 Like other Ninox Owls, they leave the nest well below full size and with abundant down. They are probably dependent on the parents for 2 to 3 months after this. Habitat: Almost anywhere where there are trees. 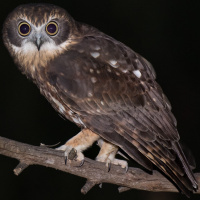 Eucalypt forest and woodland appears to be the optimum habitat but also mallee, mulga, semi-desert, tree-lined creeks, residual timber on farmland, leafy suburbs, offshore islands. 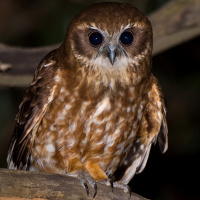 They are generally absent from dense rainforest, except for the Red Boobook of north Queensland. 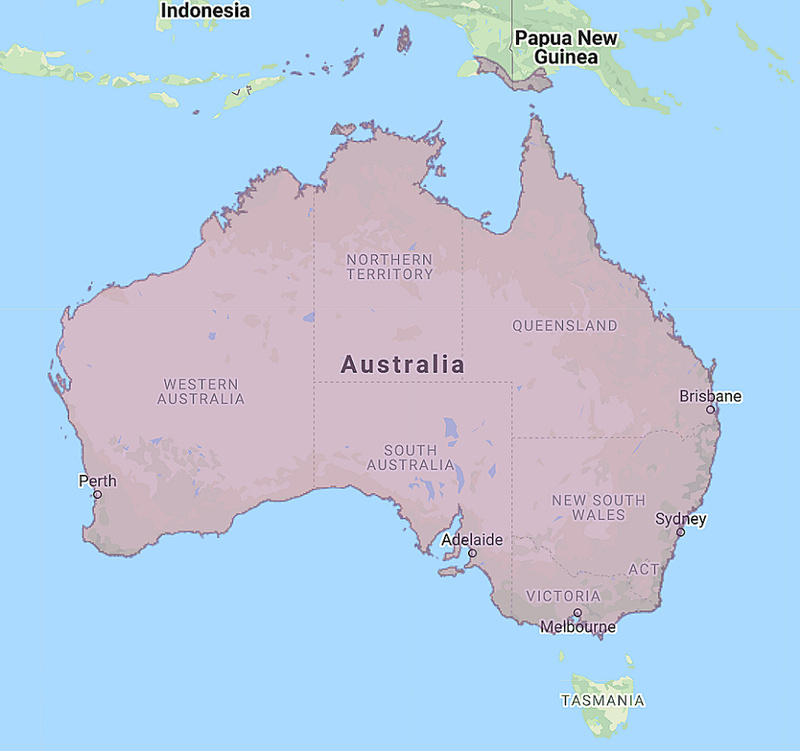 Distribution: Almost Australia-wide including many offshore islands. Lesser Sunda Islands, Timor and New Guinea. Status: Common and abundant throughout Australia. Original Description: Latham, John. 1802. 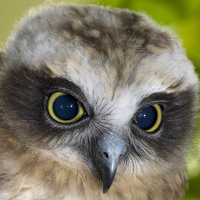 Supplementum indicis ornithologici sive systematis ornithologiae (Suppl. ind. orn. ): p. xv. Trounson, Donald and Molly. 1996. "Australian Birds - Simply Classified". New Holland Publishers. Page by Deane Lewis. Last updated 2015-12-24.